Consistent lubrication is essential when working with a wide range of tools and equipment. Everything from heavy-duty construction machinery to small-scale contracting tools requires some degree of lubrication to properly function. This is why it’s important to follow the lubrication schedules provided by the manufacturers of your respective tools. As you’ll find, failure to do so can have serious – oftentimes costly – consequences. Decreasing friction is among the key benefits of lubrication, particularly of MagLube’s renowned minimum quantity lubrication. Increased friction can lead to damaged core components, which dramatically shortens their usefulness and overall life spans. The harder parts rub up against one another, the more damage is caused. Well-lubricated parts, on the other hand, rub against each other in a much smoother manner than components lacking in lubrication. With our minimum quantity lubrication systems, you’ll be able to effectively reduce damaging friction. Like friction, heat can be minimized by a reliable lubricant. In fact, when it comes to tool and machine parts, heat and friction go hand-in-hand with one often leading to the other. The more friction, the more heat – and the more heat produced means the greater the chance of your equipment overheating. Overheated machinery can serve as the precursor to a litany of problems. Broken components, broken machinery, and injured operators are just a few of the consequences associated with overheating. MagLube’s minimum quantity lubrication system will help prevent overheating by keeping your equipment cool and functional. At the end of the day, ignoring lubrication will hurt your financial bottom line. Improper and/or irregular lubrication will result in broken parts and damaged machinery – which, in turn, will result in more money being spent on your end. Sticking to the manufacturer-recommended lubrication schedule will save you a tremendous amount of money on replacement parts and repairs. MagLube offers a variety of lubricants, all at an affordable price. Rather than spending money on costly and unnecessary repairs, our minimum quantity lubrication products will help keep money in your pocket. Keeping your tools and equipment lubricated is one of the best things you can do for them. A good lubricant allows each of a tool’s core components to carry out its respective jobs in a smooth and efficient manner. When looking for effective ways to extend the life of your tools and machinery, you can’t go wrong with ensuring regular lubrication. 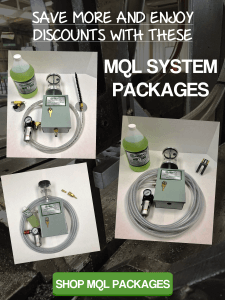 That’s why our minimum quantity lubrication systems at MagLube are well worth the investment. Shop our inventory today at MagLube.com.